Dozens of marshals in black with yellow hi-viz jackets arrived by special bus at 5.30am on this, the second, sporting and scorching-hot day in Essex, for the men’s mountain bike event at Hadleigh Farm. They promptly took up their positions at surrounding road junctions and at bus stops temporarily erected in the Salvation Army field, backing on to the flats where I live. What would we do without our volunteers? Around 9.00am the fleet of buses, First for London, started ferrying twenty thousand or so spectators to the Salvation Army fields for the next four-and-a-half hours. They were destined for the greatest course in the land, according to the TV commentators, and where Team GB’s Liam Killeen was competing for a medal. They alighted at the bus stops in their droves to the jubilant sounds erupting from the Sally Army’s brass band. The spectators of all nations, GB, Sweden, Norway, France, Spain, Holland, Italy, Switzerland and Czech Republic to name but a few; their home flags wrapped around the patriots’ shoulders, made the fifteen-minute hike to the course, encouraged by the rousing crescendos of ‘There’s No Business Like Show Business’ and ’Seventy-Six Trombones,’ wafting in the welcome wind. The ticket holders were spurred on by the official Olympic volunteers wearing sincere hospitable smiles, welcoming nations and pointing the way with huge spongy fingers. It was a sight to behold and the hyped-fun ambience filled the raw country-smelling air. It didn’t matter that Liam Killeen, through injury at Dean’s Drop, couldn’t finish his race – our initial concerns were for his welfare; it was the taking part that makes the lump in your throat stick fast, and it was the feel-good factor every soul seemingly shared on this momentous occasion for Great Britain, and indeed for all the residents of Hadleigh, Essex. Congratulations to the Olympic Champion Jaroslav Kulhavy of the Czech Republic; silver medallist Nino Schurter of Switzerland, and bronze medallist Marco Fontana of Italy. We salute your achievements. 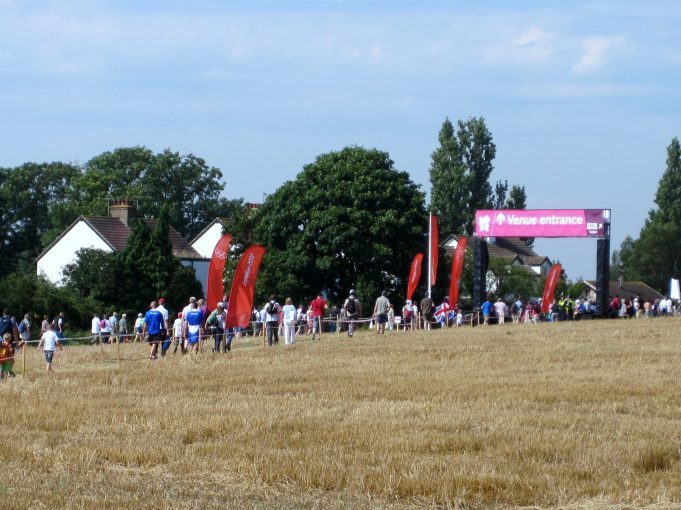 A well-run venue thoroughly enjoyed by the masses held in an exquisite part of Essex, overlooking the Thames Estuary and Kent coastline, on the edge of historical Hadleigh Castle; where hundreds of years earlier, King John rode thunderously across those very same fields, to London: home of the Olympics: 2012. Good on you Hadleigh – you did us proud!